At first glance, this is a completely ridiculous statement. "The Time War was clearly fought against Daleks!" you might say. "Look, look, right there, you can literally see them fighting the Time War on screen! See?" Yes, at first glance this is the case. But there is compelling evidence that the Daleks were simple patsies for the true enemy: giant invisible spiders. On-screen, the Time War was only a concept seen in the show's revival from 2005 onwards (discounting retcons where stories such as 'Genesis of the Daleks' are seen as 'first strikes' in this war). 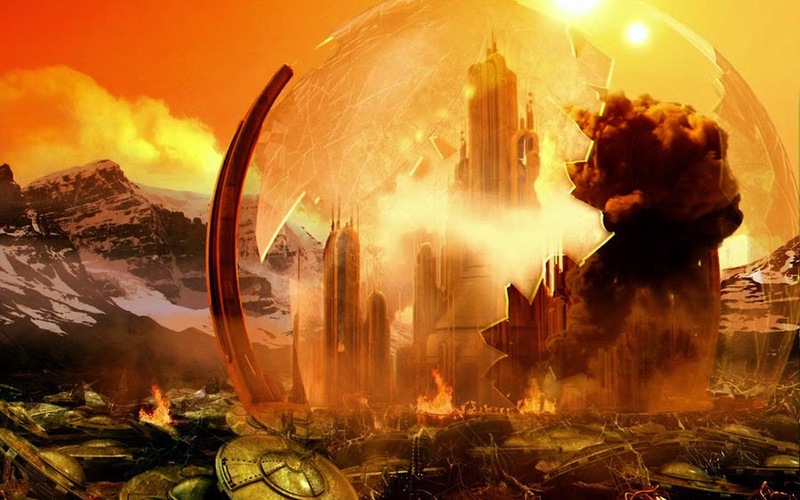 In the extended media though, the concept of an all-encompassing Time War which swept up Time Lord society and ended in the destruction of Gallifrey began in 1997 with the novel 'Alien Bodies'. The Enemy have their own 'web of time' that rivals the Time Lord's. The Enemy's home planet is said to be Earth, but not humanity. The Doctor's timeline is rewritten so that the Third Doctor regenerates on the planet Dust, missing the events of 'Planet of the Spiders'. At once the identity of The Enemy becomes clear: they are the giant invisible spiders of Metebelis 3, from the Pertwee classic 'Planet of the Spiders'. They originally hailed from Earth, only to mutate once they reached Metebelis 3, and as spiders with cosmic powers it makes sense that they would be able to weave their own 'web of time'. We know they already had time travel powers in 'Planet of the Spiders' even without the perfect blue crystal. 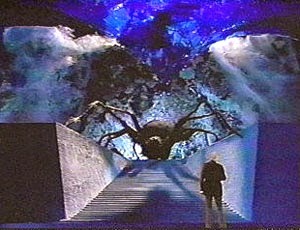 Most importantly, with the Third Doctor out of the way, the spider's attempt at reaching godhood via the blue crystals had nothing to stop it. How does this match up with the new series though? The Time War there is a different event to the book one. Or is it? The thing about a Time War is that it is fought throughout history. Time travel is weaponised. Everything falls into chaos. This is referenced both in the television show as the Time Lords talk about the insanity of the war as it constantly changes history, and the books where it is noted that the identity of the Enemy constantly changes due to time travel. The Daleks were always a nuisance in the classic series, but never a major threat to the Time Lords. They had time travel, but so did hundreds of other races. In fact the Sontarans were far more of a concerted threat than the Daleks ever were. If the Daleks were truly the enemy of the Time War, would they have let the Doctor slip back in time in 'Genesis of the Daleks' to carry out his mission? No, he would have instantly been met with time-travelling extermination squads. We've even seen one of these squads in 'The Chase', and their efforts to kill the Doctor were comical at best. Could they have really brought the Time Lords to their knees? Daleks are not cunning. From what we have seen of the Time War in 'Day of the Doctor', their primary means of combat is a shooting war, not the clever manipulation a complex Time War would need. Even their long-term plans revolve around building big armies or bombs to kill everything. Where is the subtlety which would have causes problems to the Time Lords? The answer is simple: The Daleks were involved in the Time War (as were millions of other races) but they were not the primary enemy, they simply took advantage of the situation, especially in the last days of the war. The true Enemy was the spiders. The new show seems very reluctant to use the spiders, even though they are one of the last iconic villains yet to return. Indeed in the episode 'Turn Left' there was great effort put in to not using the spiders, having Donna's history changed by a large invisible beetle on her back rather than the more obvious spider. Why go to the trouble of a clear 'Planet of the Spiders' homage and then not use one of the spiders - unless they are locked away in the Time War. Finally, the episode 'Hide' shows the Doctor completely unable to pronounce the word 'Metebelis' correctly. Surely the world on which his third incarnation met his traumatic end would stick in his mind - unless history from the 'first' Time War was still changed and the Doctor never made it to Metebelis 3 and stopped the spiders? We have never seen the spiders in the new show. But they are invisible. Perhaps they have been lurking there all along, the true victors of the Time War?